Tom Petty capped a day of reminiscences and hometown honors Saturday with an electrifying performance in the O'Connell Center. 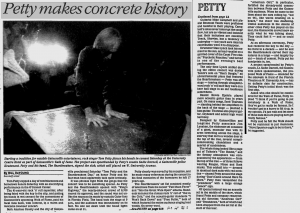 The 41-year-old rock 'n' roll superstar, after being feted with the key to the city, and putting his hands in wet cement for the cornerstone of Gainesville's upcoming Walk of Fame, paid his local fans back, with interest, in a warm and welcome two-hour concert. Both Alachua County and the city of Gainesville proclaimed Saturday "Tom Petty and the Heartbreakers Day," an honor Petty and his four-man band took quite seriously. It was obvious right from the get-go that the concert was to be something special. As Petty and the Heartbreakers opened with "King's Highway," the nearly-sold-out crowd of 8,700 roared its approval, and the sound was not unlike the raucous din made by ecstatic Gator fans in Florida Field. The band took the stage at 9 p.m., and the audience was immediately on its feet. No one sat down until the house lights came on at 11. Petty clearly was moved by his reception, and he made many references during the concert to his fond memories of the hometown he left 17 years ago. The Heartbreakers' set list consisted mostly of selections from the recent "Full Moon Fever" and "Into the Great Wide Open" albums. Standouts included the riotous rock 'n' roll of "Out in the Cold," and the acoustic-guitar standards "I Won't Back Down" and "Free Fallin'," both of which featured the entire audience singing lead vocals. On every word. Guitarist Mike Campbell and pianist Benmont Tench were proficient and tasteful in their playing. Campbell's solos never interrupt the songs' flow, but are so vibrant and insistent that their inclusions are essential. Tench, likewise, has a tendency to underplay -- but you'd sure miss his contribution were it to disappear. Drummer Stan Lynch took his moment in the song, as lead vocalist on a spirited cover of the Count Five classic "Psychotic Reaction," and turned in one of the evening's best performances. The only time Lynch smiled during the entire concert was during Tench's solo on "Ben's Boogie," an all-instrumental piece that featured the Heartbreakers -- Petty was off-stage -- tearing through straightforward rock 'n' roll as if they were on a beer hall stage in an old roadhouse somewhere. Bassist Howie Epstein played more acoustic guitar than in years past. On many songs, Scott Thurston -- standing behind the amplifiers in the back of the stage -- plucked a bass guitar. Thurston also played guitar, keyboard, and added high vocal harmony. Designed by Gainesvillian and longtime Petty associate Jim Lenahan, the elaborate set consisted of a giant, muscular tree with its arms stretching across the stage, a stairway that led to a wooden door at the top of the tree, several complicated-looking chandeliers and a quartet of candelabras. The whole thing looked like a page out of Tolkein's "The Hobbit," and the fantasy atmosphere was compounded by the appearance -- from the top of the tree -- of three fellows wearing Reagan, Nixon and Bush masks. This oddball trio -- dressed in identical dark suits with red neckties -- chased Petty around the stage during "Don't Come Around Here No More." Petty then vanquished the "presidents" with a large orange "peace" sign. Of special interest was an acoustic set in the middle of the show, which found Petty and company resurrecting old favorites "American Girl" and "Breakdown," both of which had been dropped from the set list at the start of this tour. "American Girl," in particular, fortified the already-solid connection between Petty and the Gainesville audience. When he came to the lines about the cars rolling by, "out on 441, like waves crashing on a beach," the cheer was deafening. Unlike audiences in the dozens of other cities Petty has played on the tour, the Gainesville crowd knew exactly what he was talking about. They could feel it -- and so could Petty. 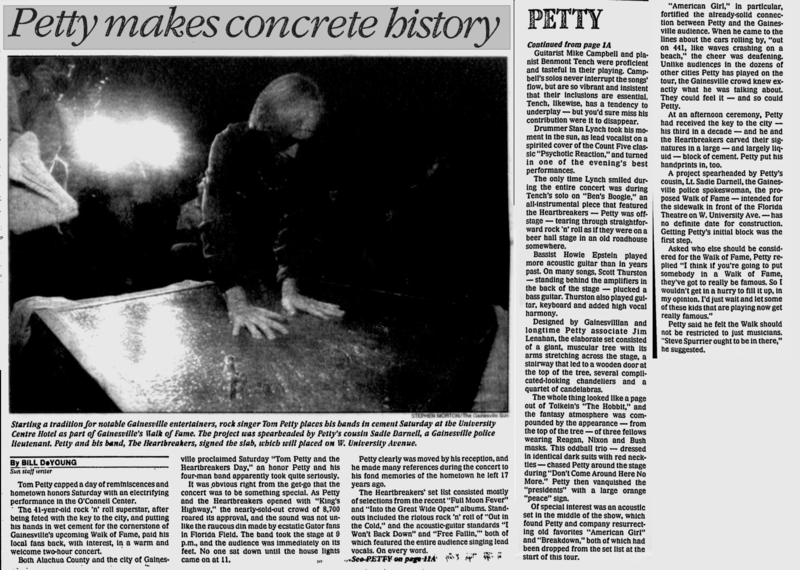 At an afternoon ceremony, Petty had received the key to the city -- his third in a decade -- and he and the Heartbreakers carved their signatures in a large -- and largely liquid -- block of cement. Petty put his handprints in, too. A project spearheaded by Petty's cousin, Lt. Sadie Darnell, the Gainesville police spokeswoman, the proposed Walk of Fame -- intended for the sidewalk in front of the Florida Theatre on W. University Ave. -- has no definite date for construction. Getting Petty's initial block was the first step. Asked who else should be considered for the Walk of Fame, Petty replied "I think if you're going to put somebody in a Walk of Fame, they've got to be really famous. So I wouldn't get in a hurry to fill it up, in my opinion. I'd just wait and let some of these kids that are playing now get really famous." Petty said he felt the Walk should not be restricted to just musicians. "Steve Spurrier ought to be in there," he suggested.